Interesting! Choice of wineries was great. Driver/guide was very friendly and accommodating. He tried!! 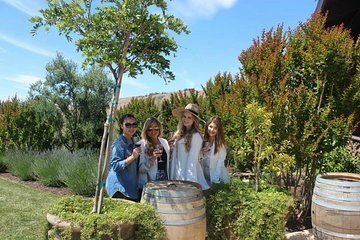 Since there were just the 3 of us on the tour, the tour guide, Tom, offered complete flexibility to us but since this was our first trip to Napa and we are not wine experts, we didn't get the benefit of a local expert to experience the Napa wineries. We were hoping to learn more about the history of Napa and the specific vineyards we had visited but the tour just ended up being a drive from one winery to another. We visited 5 wineries on this tour. The following day, we toured other wineries and were able to do 6 wineries and with a better experience due to research we did on our own. This tour was an expensive for having a driver take us from one winery to another. Lunch was so-so as well. Tom, the tour guide was extremely nice, friendly, and flexible. This was our first Napa Valley Winery Tour. Matt our tour guide and driver was very gracious and the wineries we visited was a great cross section of wineries in the Valley. This was an incredible tour and we felt totally spoiled. Would highly recommend. This is an amazing tour to take. We met wonderful, like minded people on the tour which made the day so much fun. The guide was very knowledgeable and accomodating, even found one last open winery for a final tasting for us. Wonderful vehicle, driver and terrific wineries. I especially liked the Hagafen winery which credited the price of the wine tasting only 20 if you purchase a bottle of wine. Glen was a very knowledgeable guide. We went to wineries that we would never have found or visited. The day was relaxing and full of fun. Drank a lot of very good wines.The lunch was very good and eating at the vineyard was most enjoyable. There was no rush and we traveled at an easy pace. A great day and would recommend it highly. We had a fabulous time, and really enjoyed our tour guide/driver Soccer! We loved that we got to visit wineries in both Sonoma and Napa. However, we were disappointed that we didn't get to stop at Domaine Chandon which is listed on the tour, and we specifically requested to stop at when booking. We also were under the impression as were most others on our tour that we would be picked up in a limo or small party bus. We ended up being on a large party bus with more than 30 people, but still had a great time and made friends quickly with others on our tour. We just wish we knew ahead of time instead of expecting a more private tour, and that our request to stop at Chandon had been accommodated or at least acknowledged. We also would have liked the gratuities for our tour guide to be included up front or somewhere we could have sent them at the conclusion of the tour as it was awkward for them to walk around at the last winery asking if we'd like to give another 40. We had no problem giving a tip as he was awesome, but there should be a better way to go about it.